OTTAWA – The Canadian Network on Corporate Accountability (CNCA) is greatly encouraged by the Minister of International Trade’s announcement today of the creation of a Canadian Ombudsperson for Responsible Enterprise. The human rights ombudsperson will investigate complaints concerning the overseas operations of Canadian companies and will issue public findings on allegations of harm. The office will make recommendations for redress; regarding corporate eligibility for government services; and with respect to policy and law reform. “Canada’s new corporate accountability watchdog must be transparent and free from political interference when seeking information on company activities that impact local communities,” said Ian Thomson, Extractive Industries Policy Specialist of Oxfam Canada. “Individuals and communities impacted by Canadian mining operations around the world are counting on this office to prevent and redress human rights abuse by Canadian companies,” said Reverend Jordan Cantwell, Moderator of The United Church of Canada. “The CNCA wants to ensure that the new human rights ombudsperson has the powers and independence necessary to secure its credibility with all stakeholders, including the overseas communities impacted by Canadian companies,” said Emily Dywer of the CNCA. An effective ombudsperson office will help position Canada as a global leader in business and human rights. Above Ground is a member of the Canadian Network on Corporate Accountability (CNCA), which brings together 34 civil society organizations from across Canada and represents Canadians who are concerned about the environmental and human rights impact of our extractive industry overseas. The CNCA supports communities, workers, Indigenous peoples, and environmental and human rights defenders from around the world by advocating for policy and law reform to hold Canadian companies to account. 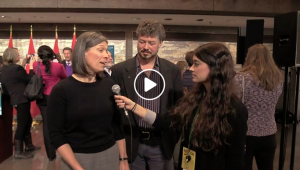 Watch interview with Karyn Keenan, director of Above Ground, and Jamie Kneen of MiningWatch Canada.